In my last blog post, I discussed proper methodologies for better estimating the total size of the stock photo licensing market. Using "asymmetric information," a term coined by Joseph E. Stiglitz, winner of the Nobel Prize for economics, one can extrapolate a truer (more accurate) assessment of market's size than what conventional methods produce. The byproduct of such analysis can have such broad and sweeping implications, that it often results in a reassessment of the underlying paradigms for a given market or industry. Given that, it requires an examination of the very business paradigms adopted by the leaders of the industry. In this case, photography. Are companies like Getty potentially missing much larger opportunities? If so, to what degree, and to what net effect? To answer that question, one person suggested that I dig deeper into Getty's 10-K filing, where they discuss their strengths and weaknesses, as they perceive them, arguments which they use to support their business strategies. It is my opinion, as this blog posting will explain, Getty's statements about the market and how they perceive their position in it and their competition are so far off the mark, I believe they are in worse condition than I had previously thought. How Wrong Can Getty Be? "The estimated useful lives of imagery are determined based on the number of years over which they generate the majority of their revenue. Getty's assumption is that, over time, their buyers will all have eventually seen their base of photos, which then need to be cycled out with fresh new images. In other words, as the revenue for a given photo diminishes, its "useful life" expires. There is only one reason why this might happen: their list of clients is so small, that they actually can go through all their images. That's right, Getty's assumption of the universe of photo buyers is so small, that they can be characterized as a fixed set of companies, mostly from the media and advertising worlds, that can actually go through all their images. Sure, those are sizable and lucrative clients to be sure. But they are limited. This means their potential for growth is limited. And no one wants to buy stock in a company whose client base doesn't grow. Now, if Getty stated that such clients were only their current market, but that it was but a fragment of the overall market, that would be more encouraging, as it would at least suggest that Getty's growth opportunities are ahead of them (and that they recognize it). But, they do not say so--they explicitly say that this is the market. They not only assume that such entities represent the majority of buyers, but also the highest-paying ones, which is also a fallacy (discussed later). To make an analogy, their perception of the total size of the market is like the solar system, and they own "Jupiter," the largest of all the opportunities. Their entire business model is focused on them and them alone because, as they imply, nothing else matters. Yet, they're making the bad assumptions that I've been talking about a lot in my blog lately about the size of the stock photo market. They believe it to be about $2B, whereas I believe it to be several orders of magnitude higher than that. Now, whether you believe my analysis or theirs, you still have the problem that Getty's own assessment of their own market is, by implication, static. Worse, that they have to cycle photos out implies that they've reached its capacity. So, answer me this: where's the growth? Perhaps you're somewhere in the middle: you don't necessarily believe my analysis, but you agree that it's bigger than Getty thinks it is. I would still argue their misperception of the market has resulted in poor management decisions... like having to cycle out photos because they believe they have a "lifespan" limitation. This is a bad decision because, if the licensing market is "somewhat" bigger than they say, why are photos having limited lifespans? In other words, if their business was growing, it would imply that they have a steady stream of brand new users who have not yet seen those images. For those users, every image on their site is new, and if that's the case, why the need to "cycle out" old ones? The simple fact that their own financial analysis shows that images have a lifespan defines the very premise that their audience is limited, and to a rather small (comparatively) market segment that isn't growing. It just so happened that yesterday, someone licensed the oldest photo on my site (shown here). 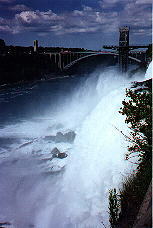 I took when I was just a tourist carrying a kodak disposable camera at Niagara Falls, long before I ever dreamed of being a photographer. The page this photo resides on is here. This also happens to be one of the oldest pages on my site, made back in 1996 (though I shot the pictures back in 1994; I keep it on my site for posterity). You'll note that this page has no high-res images, nor a shopping cart to even buy those photos. Yet, someone actually emailed me specifically to ask to buy it. Price paid: $450. Oddly, the price paid for this photo for the use in question was far more than what a "sophisticated buyer from a media company" would ever pay. And this has always been the case for consumers licensing photos: they pay far more than the sophisticated buyer does. And that's just the one page on my site. Consider all the pages on my site that links from other sources on the net. Using tools provided by google and yahoo, the range of links on the net that go to my site range from about 70,000 to about 115,000. The number of links that go directly to my images are not included in those numbers. Now, the point: Sites that link directly to photo pages owned by Getty? Zero. This is partially because they don't set up their photo pages in ways that allow or permit such links. Their entire system is run by a database with a web front end that contains no static html pages that people could link to if they wanted to. (Well, they could, but to do so is beyond most people's technical expertise.) But the real point is that, because Getty believes their images have a lifespan, they are removing extremely valuable content that would otherwise be working in their favor by getting higher and higher rankings in search engines, thereby generating traffic to their site. In my mind, this is yet another example of Getty's squandering opportunities that they don't even realize exist. Some have said that I am giving away secrets. Well, you can only do so if someone understands the market in the first place. They simply don't understand the market. We believe that the principal competitive factors are: name recognition; company reputation; the quality, relevance and breadth of the images in a company's collections; the quality of contributing photographers, filmmakers and other imagery partners under contract with a company; effective use of current and emerging technology; customer service and customer relationships; pricing and licensing models, policies and practices; and accessibility of imagery and speed and ease of search and fulfillment. Since Getty's perception of the photo-buying universe is limited to sophisticated buyers from the media and advertising worlds, then I agree with the above assessment. But if you recognize the larger opportunities that the net provides, only a few of those things matter. To the point: absolutely no one who licenses my photos has ever heard of me or my website before they got the image. I get about 10% return visitors on average, but the bulk of sales are always to brand new people. It does not require name-recognition (by buyers) to sell photos. Now, I'm not suggesting there's no value in name-recognition. There clearly is, and I've spoken about it frequently. But, in a world where most people have never heard of photo licensing, having a "name" is as irrelevant as having a McDonalds restaurant in a land that's never seen westerners. Sure, you want to build the brand, but unless and until you do, that's not what's going to bring in customers. European companies are constantly trying to penetrate the American market with products and store fronts, yet many fail because they make the same mistake that Getty's making: they believe their name-recognition in their home country maps over to the US market. And that's one major reason why Getty's reliance on name-recognition (within their smaller market segment) is a catastrophic error in strategy in their 10-K statement. When is name-recognition important? As I advise photographers that ask how to build their web presence, name-recognition is vital if you want people to link to you. One needs to be known for something; be an authority on a subject. You want people to quote you. You want to write about things and put the content on your site so that people will reference it. And if you're successful at this, then other sites link to you, which gives your site higher rankings in search engines, which brings the traffic, which allows the content on your site to be seen, which turns into sales to buyers who have never heard of you. There are also hundreds, if not thousands, of small stock photography and footage agencies, image content aggregators and individual photographers throughout the world with whom we compete." "...hundreds if not thousands"? Try millions, if not tens of millions. Many of them are photographer sites like mine, but they are also photo warehouses full of images that represent millions of other people. Yet, it's critical to understand this key factor: it's not the number of competitive sites that license images, but sites that have photo content that potential buyers are using instead of going to Getty. Because Getty is not getting the traffic that is going to other sites, those are lost financial opportunities. I consider my site to be a very small, but working prototype of a consumer-oriented licensing site for one and only one reason: I attract unsophisticated buyers. If I were to extrapolate my own personal web and sales data to that of Flickr's, were they to enter the stock licensing business, I would use ratios that map my data to theirs. I.e., if I take the ratio between the total number of photos on my site to the total number on Flickr's, and make a similar mapping of traffic between my site and Flickr's, and if I assume that Flickr licensed photos using the same license fees that I do, Flickr would yield about $1-2B annually. Granted, that's total revenue, which would have to split with the photographers, but that doesn't discount the viability of the business model. I've criticized Getty for many things, and at the top of my list has been their needless acquisition of photo agencies. Photos and photographers are like weeds. You can't pick them fast enough--more will come. Getty's misunderstanding of this needs to be fixed. It needs to be replaced with a realization that value is not in the photos, but instead, in web presence. The photos don't matter--the only thing that matters is that buyers find them. And once they do, they are more likely to buy. So, how can they be found? Well, as any web-savvy company run by a 22-year-old college drop-out knows, it's just like real estate in a tourist town: location, location, location. You can have a crappy store with cheap, overpriced products; but if you're on the corner of two busy streets, business will be good. Getty's in the back alley with great stuff for sale, but only the locals who live there are aware of them. They're loyal, but very small in the broader economic engine. The much larger population of tourists is totally unaware of them. Which brings me to my solution for them: Buy Flickr. Given Yahoo's troubles at the moment (and their similar ignorance of the photo market opportunities), I'm sure Getty could get it for a pretty fair price for all involved. This would not only show that they now "get it" (that the photo universe is what it is), but they would be armed with a web property and membership community (not to mention traffic and good will) that is perfectly poised to exploit this untapped market called the consumer photo buyer. Need help with this? Call me.